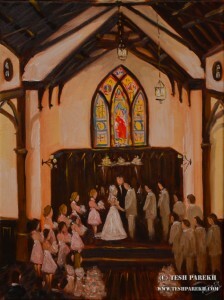 One of my first live wedding paintings was at the beautiful All Saints Chapel in Raleigh. That was a watercolor painting of ceremony back in 2009. So, this historic chapel is very special to me! And I was excited to be commissioned by Ashley’s parents to paint live there again. This was a live wedding painting commission of ceremony in oil. 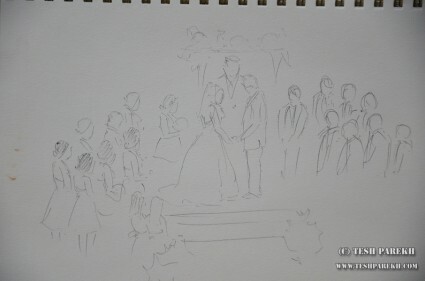 Ceremony sketched live in pencil. I use my sketches for reference. Ashley & Chris. 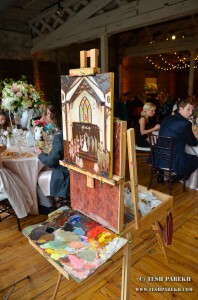 Live Wedding Painting at the All Saints Chapel and the Stockroom in Raleigh NC. 16×12. Oil on linen. This painting was pure oil. I do not use acrylics or any other mediums to dilute oil paints. I do not use toxic materials. I use artist-quality materials and supports. Professionally framed and carefully displayed painting should last for many decades. The same is true for my watercolors. Since I offer live painting in both oils and watercolors, clients often ask me which one is my favorite. The answer is- both! Oils are a traditional medium. Medium of old masters. Watercolors are unique in their own way. Both mediums offer excitement and challenges. It is a personal choice. Another question I get asked is: if I accept studio commissions that are done from the photos. The answer is – yes. If you are already married, or are not able to secure my live wedding painting service, please know that I do accept studio commissions. I work from reference photos to create the paintings. In fact, I am currently working on a watercolor commission of another All Saints Chapel ceremony! Ashley & Chris. 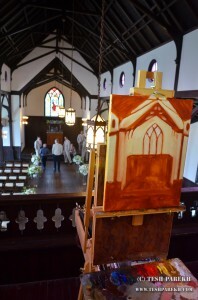 Live Wedding Painting at All Saints Chapel. Oil on Linen. 16×12.